In an effort to make the world’s biggest soccer competition more inclusive, the sport’s governing body last month voted to change the format of the World Cup starting from 2026. Under the new format announced by the Fédération Internationale de Football Association (FIFA) Council, participating countries will increase from 32 to 48. The tournament’s eight groups of four teams each will also be replaced by 16 groups with only three teams each. And African countries—historically dramatically underrepresented in the competition—see an opportunity to grab a bigger slice of the pie. The new World Cup format, pushed by Gianni Infantino, FIFA’s president, to fulfill a campaign promise, was always going to create a power tussle between continental soccer federations seeking extra places at the competition. With around a fifth of FIFA’s 211 members set to participate under the new format, FIFA has yet to announce how it will decide who gets extra places. But Africa and Asia, the largest voting blocs in FIFA elections are likely to get more extra slots than other continental federations. For Infantino, growing political support in the two crucial continents will be key to retaining his presidency when he likely seeks re-election. Other continents have made similar requests to increase their tournament slots. Europe, historically the best-represented region, wants its slots increased from 13 to 16. The Confederation of African Football (CAF) will likely lobby to double its current number of guaranteed spots and get ten African countries to play in the 2026 World Cup. ”All associations back the idea to expand the World Cup and there is the hope that Africa can have 10 places in future,” Danny Jordaan, South Africa’s Football Association (FA) chief, said after meetings between the continent’s FA bosses and Infantino. Should FIFA grant CAF’s wish to double its African quota, it will represent a key moment for African soccer teams, which have long been vocal about their underrepresentation at the global event. 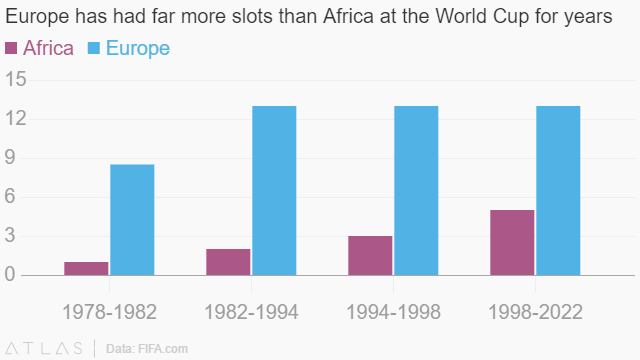 Since 1978, Europe has held more than double Africa’s guaranteed slots. Come 2026, that gap could start to narrow.